This past week I did a lot of research on stocked and wild trout waters in Maryland. There are so many streams to fly fish in Maryland this time of year that it is difficult to zero in on one location. I focused on streams in the middle to southern portions of the state where the wind speed was expected to be 5mph with gusts up to 10mph. I find that when I attempt to film in wind above the 10mph mark, it is a lost cause. After going back and forth, I finally settled on the Patuxent River. The Patuxent creates a border between Howard and Montgomery Counties and is the longest river entirely contained within the state of Maryland. The river is over 100 miles long and is a tributary to the Chesapeake Bay. The Patuxent also has an interesting history as it was given its name over 250 years ago by the famous settler of Jamestown, Virginia, John Smith. The river is a freestone stream that stays marginally cool in the summer. I’ve read that some fishermen claim to catch wild and holdover stockies throughout the year, but I can’t confirm those stories. The Upper Patuxent River has almost 13 miles of water that is designated by the state as catch-and-return trout fishing. Trout are stocked during the preseason during the months of February and March. There are additional in-season stockings as well. 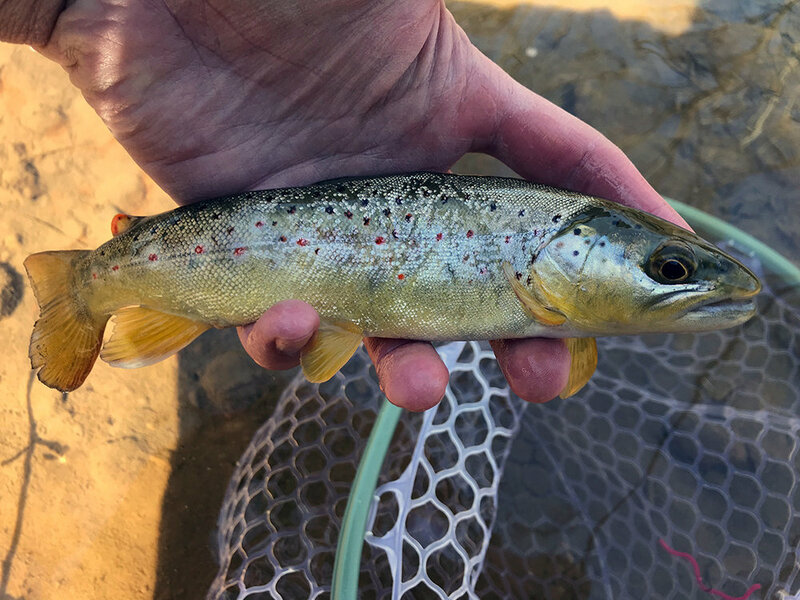 This catch-and-return area is an artificial lure only stretch and the Potomac/Patuxent Trout Unlimited group aides in the stocking, helping to evenly spread the fish out through the many miles of hard to access water. 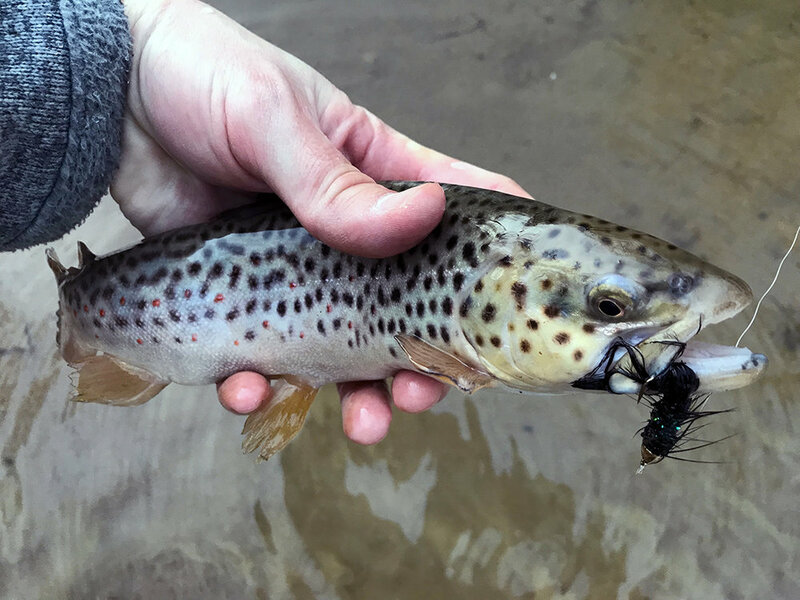 The Maryland Department of Conservation website had mentioned that almost 2,400 trout, some rainbow and some brown trout had been stocked in the river since late February. Looking downriver on the Patuxent River in Maryland. I headed south to Maryland at 5AM on Saturday morning. The stocked portions of the Upper Patuxent start just below Rt. 27 and run to Rt. 97 on the downstream end. If you look at Google Maps, there are several roads that cross the Patuxent in the stocked section. I decided to start at the top of the Upper Patuxent and fly fish upstream to Rt. 27. I parked at the Long Corner Road Bridge and got geared up. There is a small parking lot before the bridge and when I arrived there were no cars. I wasn’t sure if this was a good thing or a bad thing. The areas around the bridge were well marked with catch-and-return regulation signs. I decided I’d use my 9’-5wt Winston with my Hatch 3-Plus with a 9’-5X leader attached to my fly line. I tied on a #18 Gold Beadhead Prince Nymph and off the hook bend I dropped a red Squirmy Wormy that utilized a jawbreaker style tungsten bead. The Prince Nymph is a great pattern for early March because it does a great job of imitating the Little Black Stoneflies that hatch this time of year. I walked out on the bridge and looked upstream. I was surprised how shallow the water was. I didn’t see any fish swimming below the bridge and figured the fish must be hidden upstream. I started hiking. After I got about 200 yards upstream, I encountered a couple of small runs that had water deep enough to hold trout. I drifted my rig and instead of hooking up with a trout, I caught a fallfish. After another 100 yards of hiking and not seeing a single fish, I found it virtually impossible that they had stocked trout in this section. I remembered seeing on maps that there were several larger streams that dumped into the Patuxent further downstream. I figured more water meant a better chance of finding fish. I decided to drive all the way to the bottom of the catch-and-return section at Rt. 97. There is a small lot at the entrance to the Patuxent River State Park where you can park. Again, I found no cars which made me question if I was in the right area. The river was holding more water in this area, both in depth and width. I grabbed my gear, jumped in the water and started walking upstream. There is a beautiful stretch of water that sits next to a large grove of bamboo trees. The area looked incredible but with polarized glasses I didn’t see a single fish patrolling the area. I put a few drifts through the deepest pockets with no luck. Where were all the fish? Certainly with 2,400 stocked fish, you’d be bound to at least see one. I’d covered the top and bottom and was starting to lose faith that I’d find fish. It was going on 9:30 and I decided I’d give it one more shot right in the middle of the catch-and-return section. I found a road on the map named Hipsley Mill Road that cut the section almost in half. When I arrived at the parking area at Hipsley Mill Road, there was already a truck sitting in the lot, an encouraging sign. I walked to the bridge and peered into the water. No fish again. I threw my waders back on, grabbed my rod and headed downstream. After about 100 yards of walking the creek, I passed by a hole where I saw a solitary rainbow trout. It was only one fish, but if it was stocked it meant I may have found fish. I continued walking. As I was walking a high bank I looked into a deep hole on the backside of an old deadfall’s root system. I stopped and did a double take. There in the water was a school of almost 20 trout. I couldn’t believe it. This first batch of fish had been stocked almost 200-300 yards downstream. I’d read that poaching was been an ongoing problem on the Patuxent so it was all starting to makes sense. The Trout Unlimited group made sure these fish were well spread out so that the only folks that would get an opportunity to fish for them were serious fishermen willing to take a walk. I crept back upstream and made a downstream approach on the fish. I got into place and started making casts and then wham, I had my first Patuxent trout on the line. I spent a good twenty minutes in that hole catching fish after fish. They were split 50/50 with takes between the Prince Nymph and Squirmy. The first brown trout I caught on the Patuxent River. I worked my way downstream and saw a fish or two scattered throughout the riffles. After about another half-mile of fishing, I again stumbled onto a run that was loaded with trout. I stopped and fished here and caught a large number of brown trout on everything from Prince Nymphs to San Juan Worms and Green Weenies. The fish were only somewhat active and many seemed lethargic, perhaps due to water temps that were hovering around 40 degrees. After posting some good numbers, I continued my hike. The Patuxent River is a tough body of water to walk downstream on. The stream has very high banks, as high as 6 feet in some areas, and the edges of the river are covered with thorn bushes. To make matters worse, many areas close to the bank are covered with a soft muddy silt mixed with clay. On several occasional my leg was swallowed almost to my knee. I also had an incident where I was attempting to walk around a large deadfall and while trying to walk across what I though was a sturdy log, I soon found that it was dead. Out of nowhere I fell through log into an 8 foot deep hole with about a foot of water in the bottom. I cut my hand pretty bad on the way down but was able to pull myself back-up to safety. Fishing by yourself can be risky and it is probably a good idea to always let someone know where you’ll be before you head out. Also, ensuring you have a cell signal when fishing along can be a savior. There are many long riffles and deep holes on the Patuxent. Some areas were so deep you couldn’t see the bottom and I’m sure there were some larger fish holding in some of these areas. By mid-afternoon, I’d walked a few miles downstream. It felt as if I was in the middle of a vast wilderness. It’s hard to believe DC isn’t that far away. During my time walking downstream, I didn’t see another soul. Several miles downriver I had some spectacular takes on the San Juan Worm. I was fishing areas where debris from high water had gathered along the bank. Apparently, the folks who stocked the fish realized these places would provide great cover for the trout. On one occasion I had cast my nymph rig upstream to drift my flies in front of the debris. I watched a brown trout dart out looking for what caused the commotion. I pulled on the rod thinking the fish had attempted to take my fly and I realized he had not. As the San Juan floated for a second in the water the trout charged the pattern and took it. I set the hook and he fought like crazy. I love those types of takes. One of many beautiful runs on the Patuxent River. I was keeping my eye on where the sun was positioned in the sky as I kept moving downstream. I knew that at some point I was going to have to stop and head back but I was hoping I’d come across a bridge or road, but as far as I could see the river kept meandering through the woods. I encountered trout the entire way. I finally stopped as the sun fell below the tree tops, took off my jacket, took a long drink of water and started the long trek back towards where I’d started the day. Fortunately, I found a horseback riding trail that sat thirty yards off the river. I was able to follow this a majority of the way back to Hipsley Mill Road. One thing to be aware of if you are fishing the Patuxent River for the first time and walking back in this section is that the Cabin Branch Creek dumps in upstream. If you aren’t careful, the horse trail follows the Cabin Branch Creek and veers away from the Patuxent, and it is not readily apparent that you aren’t on the Patuxent as it looks as if the water just splits into two channels. When I made it back to the first stretch of water I started fishing, I threw on a Black Wooly Bugger just for kicks. On my second strip I caught a nice brown trout which was a great way to end the day. As the daylight faded, I made it back to my truck and briefly chatted with another fisherman who’d walked upstream. He’d found a few fish but not as many as I had. He too had encountered quite a few Little Black Stoneflies. After we finished chatting, I broke down my gear and started the two-hour ride back home to Pennsylvania.